Sample anywhere, anytime using the SP-404SX’s built-in microphone. And since the SP-404SX can run on AC or battery power (six AA batteries), it’s easy to record wherever and whenever inspiration strikes. Just power-up, point, and record. Line and mic inputs are also available for recording direct or with an external microphone. 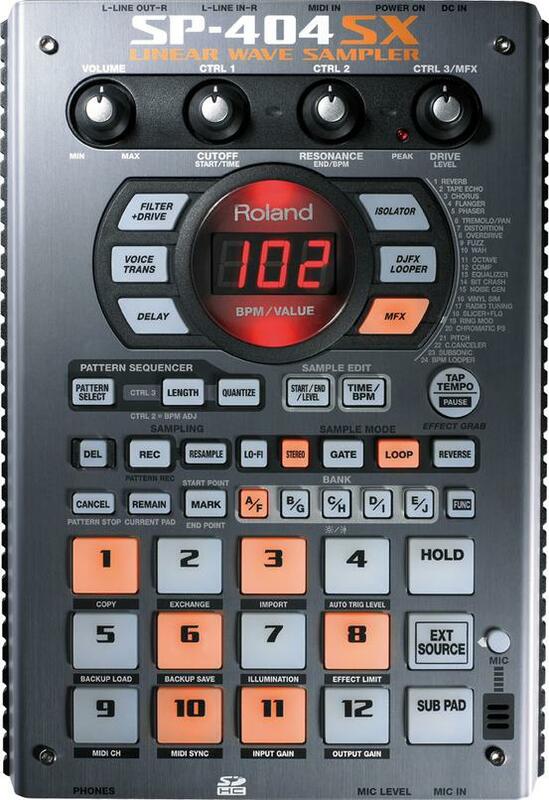 The SP-404SX’s sampling format is uncompressed wave for high-quality audio capture. The SP-404SX is made to be played — it’s packed with interactive controls for jamming along with loops and patterns. Put your fingers on the three non-slip control knobs, 12 trigger pads, and Sub Pad for rapid repeat triggering in real time. On dark stages or DJ booths, the SP-404SX is a performers dream with its illuminated rubber pads and bright LED screen. Create a signature sound using the SP-404SX’s 29 DSP effects, which switch seamlessly during live performance. Essential onboard effects include spacious reverbs and choruses, plus filters and delays. There are also unique, esoteric effects built in, including a voice transformer and looper. With the DJFX Looper, you can create short loops (such as machine-gun-like “da-da-da-da-da” sounds) and control reverse-playback with the knob. You can also create scratch effects like a turntable. Connect the SP-404SX to a DJ mixer and use it as an effect processor. Seventeen of the effects have a “limiter” mode, which keeps the effects from overloading. This is great for live DJ performance when you don’t want to lose control of the effects in the heat of the moment.